Item Number: 266-2-73 17866 Actual Weight: 1 lb. 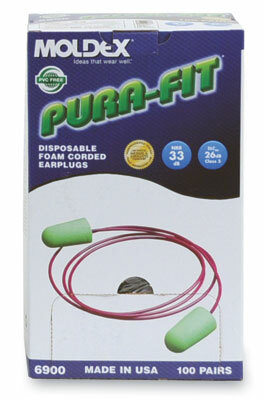 Extra-soft, lightweight foam with a tapered design seals gently and snugly without pressure. Bright green color is easy to detect for compliance checks. Independently tested to ANSI S3.19-1974. Noise Reduction Rating, NRR 33. 100% PVC-free. Dispenser box contains 100 individually wrapped pairs of corded earplugs.